Today, we will do a Kadence Frontier Series Review. Are you a new guitar user? Are you looking to learn the guitar? If yes, this one is the perfect option for you which would fit into your budget as well. We are speaking about the Kadence frontier series guitar which is one of the best options for you when you’re learning the guitar. Today we would go into the details of this guitar in order to provide you with a glimpse into the features as well as the pros and cons of this guitar. This is one of the very few guitars which come with the equalizer. The guitar is built from rosewood. This would ensure that the acoustic effect of the guitar is much more superior as compared to the others. The material from which the top of the guitar is made in spruce wood. This ensures that the guitar is of pretty high quality as well. Also, due to this very fact, the guitar is pretty durable and can last for a longer period of time. The strings are made of stainless steel. The guitar comes with the strings as well as the strap and also the guitar case as well. This ensures that you are able to get most of the accessories along with it. It also comes with a couple of picks. The guitar has a height of 39 inches. This ensures that the size of the guitar is perfect as well. Also, the short size of the guitar ensures that people of all age groups and genders can easily hold the guitar while playing. Since it is made from wood, you can be sure that the build quality of the guitar is pretty good enough. The tuner which is on the guitar is not efficient. However, due to the affordability, you cannot expect perfect tuner on this guitar. So, if you’re looking for a starting range guitar, this one is the perfect option for you as it provides you with a good balance of performance as well as build quality. 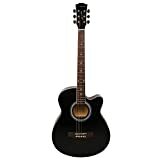 Also, since the guitar would last for a longer period of time you would not have to worry about buying any other guitar when you’re looking for Kadence frontier series guitar.